We just finished off our summer with a brilliant fishing trip to the Gradac river in Serbia. I don't get out fishing as much as I used to, but a trip is to a wild, beautiful river like the Gradac in western Serbia, is well worth the wait. The Gradac is a world class trout stream, equal to any in Wyoming or Argentina, and although not as famous as other Balkan trout streams such as the Soča in Slovenia or the Gačka in Croatia, it doesn't get as crowded as they can. We usually fish for trout in Slovakia, so this was a great excuse to visit Serbia. Hungary is not a trout fishing paradise. The main target for fishermen here is carp. I do not do carp. I do not like carp. Carp are the Donald Trump of fishes - fat, rich, arrogant, dumb, piggish - but they do great in the polls among the uneducated. Carp grow huge in Hungary's weedy, shallow lakes and irrigation ditches. "Rough anglers" pay to fly in from the Netherlands, Britain and Italy to haul out a big, fat, Hungarian carp, take a snapshot, and release it to continue its life mucking about inhaling other fish' eggs. Although there actually are trout near Miskolc in the Garadna and Szinva creeks, they are hatchery cloned fish dumped in for the weekend crowds. And there is the Jósva, Hungary's only healthy limestone trout stream, right along the Slovak border - inside a National park basically closed to fishing. About fifteen years ago my buddy Claude and I were on a picnic with friends from the old Sixtus Kapolna Pub, and we sneaked off to fly fish the Jósva, which was off limits to all except dozens of local poachers who sold the trout to local restaurants. Claude - who is a lawyer and thus has no respect for the law - knows that poaching isn't just a way to cook fish, and so we each took our first Eastern European brown trout. Representing La Belle France, Claude takes a Gradac brown trout. Since then we have fished all over Slovenia and Slovakia, and since Claude now works in Serbia, he discovered the River Gradac near Valjevo in western Serbia, which is under the guardianship of host and fishing guide Saša "Roka" Bencun, the talented proprietor of Roka Fly. The Gradac is one of the most unspoiled rivers in Europe, protected by a steep, impenetrable limestone canyon. You can't drive a regular car down the canyon to the stream without a parachute.When Saša is not fishing, he works as a ski instructor. Saša drives you down the narrow canyon donkey path in his tiny four-wheel drive Jeep with all the skill of a champion slalom skier. The Jeep ride is an extreme sport experience in itself. Saša Bencun runs a small fishing lodge near Lelić, which sits on a hillside two minutes walk from three great pools on the Gradac, and he has a lifetime of experience fishing the Gradac. He knows the fish and their habits intimately, and puts that into practice as a fly tier who has won international awards for his skill at tying hyper-realistic mayfly imitations that - he claims - actually catch fish. In reality, these are collector pieces, and most of the time Saša fishes classic flies from his own tying vise for the wild brown trout in the river. Too pretty to fish, too small for an art gallery. In practice, Saša also ties practical flies that match the insects of the river perfectly. 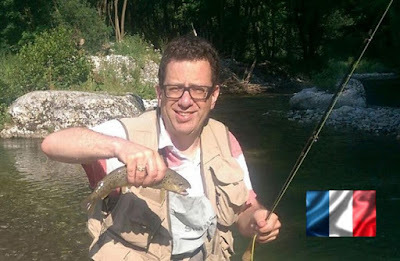 Typical of Balkan trout, the wild brown trout (and grayling) in the Gradac grow to huge sizes eating a diet of big food - minnows and leeches - and some of Saša's patterns were more like the flies used on big Western rivers in the USA than the delicate New England stuff I tie. Those big patterns are best when the river is flooded and the pools run fast and deep in the spring. We visited in late August - not the best season - and at that time of year the fish can afford to be picky eaters, and often ignore hatching insects to gorge on ants and grasshoppers and other land insects that accidentally fall into the river. Balkan tiers love big streamers with heavy cone head weights to sink them into the deeper pools where big trout tend to hog the best feeding lanes. The largest flies I use are about half the size of Saša's Wooly Buggers seen above. I have been tying flies since I was a Boy Scout... and I still do. I tie because it has always been a compulsive hobby for me - I give most of my flies away for free to other fishermen. I probably have the largest secret stash of elk hair in Eastern Europe. I have two tying vises. I remember the puzzled face of my friend Yankl - an Orthodox Jew - as he handed me a bag of furry tanned rabbit faces I had ordered from the USA for tying hares' ear nymphs. I can appreciate the perfectionism that Saša puts into his flies. Master fly tier at work. 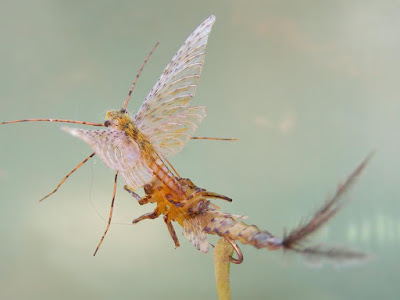 But my theory is a bit simpler: After tying dozens of different patterns I tend to to fish only a few: wingless Adams, Hare's Ear nymphs, tiny bead head pheasant tail nymphs, dry deer hair caddis, red tags, prince nymphs, ants, and muddlers. As John Gierach wrote "If the fish looks up its an Adams, if it looks down its a Hare's Ear Nymph." I don't have time to fish a lot of different patterns: I think size and color are more important than exact imitation. Maybe I don't catch that many fish, but fly fishing isn't really about catching fish at all. It is about fishing. It is about being in beautiful, remote natural places while matching wits with an apex predator that has a brain the size of a lentil - and losing. Just upstream from the cabin was one of the most picture perfect trout pools I have ever seen. All four of us fished it for the entire weekend without any luck. A rainy period had flushed a lot of insects into the river and the trout had been gorging all week. They were in the river but not hungry, and not interested in anything we threw at them. There are a lot of strategies one can use in these cases: dry fly casting, short line "Polish" nymphing, stripping streamers, or my favorite: throwing everything at the trout and waiting to see what sticks. It was easy to cast a fly line without getting tangled in the bushes - the grass banks along the Gradac are cut regularly with a weed-whacker - and I rarely had to wade the river more than ankle deep. Because I travel by train I usually don't carry waders when I fish - and I was perfectly comfortable stepping into the Gradac in sneakers and shorts. Fumie has her own unorthodox style of fly fishing. She isn't afraid to get wet, she isn't a great fly caster, she prefers to fish only two patterns of fly chosen for their "cuteness", and she still expects me to tie her leader knots, but she usually out-fishes me three to one. On this trip we each landed and released one fish each. Not exactly monsters by a long shot, but wild trout nonetheless. Giant trout that attacked my fly with the ferocity of an alkaline AAA battery. The Gradac is a strict catch and release fishery - fly fishing only, no barbed hooks, no bait, and patrolled by a Fish Warden regularly who checks for licenses - which Saša provides for guests. Lucky for the fish, Saša's wife does all the cooking at the cabin, and we had great Serbian food: gibanica cheese pie for breakfast, stuffed grape leaves and meat in kajmak sauce for lunch and dinner. If I have been standing in a cold mountain river all day the last thing I want to eat at the end of the day is a fish. I'll blog a bit later about the rest of our trip through Serbia: Serbian food is one of my favorite cuisines. Serbian lunch: nobody goes away hungry. 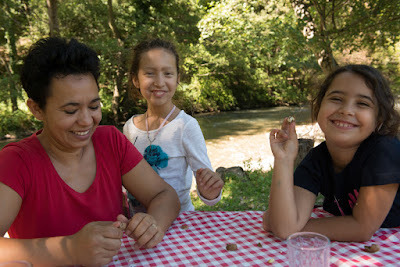 After lunch on Sunday Fumie hiked two km downstream with Claude's wife Mina, and their daughters Kali and Hani to visit a local "Skok po Skok Ecofarm" near one of the monasteries that dot the mountains throughout Serbia. This was the last trip of the summer for the amazingly multilingual Kali and Hani, who each already speak English, Romani, Romanian, Russian, Hebrew, Serbian, and French and began attending school in Belgrade right after we returned. The girls are still a bit small for fishing, but I have a feeling that pretty soon Claude will be investing a small fortune in graphite rods and custom waders. And I'll be tying a lot more flies. Mina, Kali, and Hani: non fishing fun. Hopefully we'll be back next spring when conditions are better for feeding trout (Claude caught and released nine trout last June.) We returned to Belgrade, and then went on to Novi Sad - Serbia is one of the most unique travel destinations in Europe, with a character all its own - still local and regional, and not overrun by the big globalized shopping malls and brands that have made so much of Europe one big shopping mall. Serbia was just the trip we needed to end our summer, and we can't wait to return!